The title may seem strange, but for most species of mushrooms, there is a question as to whether the mushroom is able to treat the diseases/symptoms that have been attributed to it. Unlike microscopic fungi that have yielded some compounds of significance such as penicillin and cephalosporins, many medicinal mushrooms have been utilized as traditional medicine and have never been critically studied to determine if can indeed treat the ailments that have been claimed. Another words, they are comparable to herbal medicine. It is also referred to as Herbalism, Botanical medicine or Herbology and is defined by UK-Skeptics (2004) as the use of plants, in a wide variety of forms, for their therapeutic value. Herb plants produce and contain a variety of chemical compounds that act upon the body and are used to prevent or treat disease or promote health and well-being. However, as in the case of medicinal mushrooms, several well known herbals have recently been critically studied, resulting in conflicting conclusions. For example Hypericum perforatum, commonly referred to as St. John's Wort has been used as a herbal since the time of ancient Greece in treatment of depression, but according to the Hypericum Depression Trial Study Group (2002), extracts from this species was ineffective in the treatment of major depressive disorder. However, several European studies have concluded that St. John's Wort was effective in treating mild to moderately severe depression (Reviewed in Linde, et al., 2005). Why the difference in results and conclusions? Different experimental procedure? poor methodology? For example, China does not use control experimental procedure. Another popular herbal is Ginkgo biloba, which has been demonstrated by Solomon, et al. (2002) and Snitz, et al. (2009) to not improve memory, attention and enhance cognitive function any more than a placebo. Nevertheless, some species have demonstrated curative properties that have stimulated further studies. This is similar to what has occurred with medicinal mushrooms. Numerous mushroom species have had various compounds that have been extracted that initially have been demonstrated to have curative properties. However, the initial tests that have been done is based on quick scans for novel compounds that can, for example, inhibit tumors, but these are invivo tests where isolated tumor cells, grown in culture, are tested. While a novel compound may prove effective against the tumor, invivo, that does not mean that it will translate into a useful compound (Hobbs, 1995). Think back to antibiotics. When a species was discovered to inhibit/kill bacteria that did not mean that it would become a usable antibiotic for human use. More often than not, the antibiotic was too toxic to even go beyond animal testing. An example of a species that was shown to have initial promise is Calvatia gigantea, during the early years of testing mushrooms for medicinal compounds. Between 1958-1959, Lucas, et al. (cited in Beneke, 1963) determined that extracts of this species, named calvacin, contained strong tumor-retarding substances in immature basidiocarps. Roland, et al. (1960) continued this line of research by isolating, identifying calvacin and performing invivo test, with cultures of 24 lines of mouse, rat and hamster tumors that demonstrated antitumor activity in 14 of the tumor types. Unfortunately, with the onset of clinical/animal testing, Sternberg, et al. (1963) observed numerous side effects, including anorexia, acute liver failure, muscle inflammation and bleeding from the lungs. Some rats receiving the highest dosages administered, died with two days of the experiment. Mushrooms have been utilized in folk medicine since ancient time (Wasson and Wasson, 1957; Wasson, 1968; Hobbs, 1995). The species of mushrooms used varied in different cultures, i.e. more species have been used in China and Japan than in Western Cultures. It is probable that the difference in usage relates to the mycophilic vs. mycophobic nature of the respective cultures as recognized by Wasson and Wasson (1957). In Western Cultures, the most prominent recognized species and possibly the only one that was identified with any degree of certainty, at the time of the ancient Greeks, was Fomitopsis officinalis. Hippocrates also mentioned fungi and offered their use for certain ailments, but it is unknown as to what species he may have been referring. Dioscorides, a physician around 55 A.D., who is known for his De Materia Medica, the most widely used herbal during his lifetime and for the next 1500 years, had the most influence in Western Culture and probably played a substantial role in the absence of mushroom usage as food as well as in medicine. Pliny and later Galen also held fungi in low esteem. Their opinions, undoubtedly influenced the mycophobic attitude of mushroom in Western Society that continues, to be with us today. However, even they recognized and included F. officinalis among the medicinal plants that they utilized to treat various ailments. Other species utilized for medicinal usage were other bracket fungi; Fomes fomentarius, Phellinus ignarius, Fomintopsis pinicola and others were often used to stop the bleeding and to dress wounds (Hobbs, 1995). However, in China, where mushrooms are considered to be the elixir of life, mushrooms have played an important us in medicine for as far back as 7,000 years. Numerous species are recognized, including Lentinula edodes, Hericium erinaceum, Flammulina velutipes, Auricularia polytricha and Tremella fuciformis, to name a few, and these are species that are also prized for eating, as well (Hobbs, 1995). Only a few species containing these compound are being studied. Over 30 species of mushroom have shown anticancer action in animals. PC-SPES, that includes a GLPS fraction, has been demonstrated to control Adenocarcinoma of the prostrate cancer cell line by inhibiting the cell division and growth of their cells (Lu, et al., 2002). This is a very simple and naive explanation of the mechanism, and there are other various mechanisms by which such compounds have been determined to, but an exhaustive explanation of the various means by which these compounds act is beyond the scope of this course. Various species of mushrooms have been valued as nutritious and tasty food in many parts of the world has been documented by Chang and Hayes (1989) in Zaidman, et al. (2005). The nutritious property of mushroom is also another means by which they can be benefit the health of the person ingesting mushrooms. Although there is ample evidence that some mushroom extracts have potentially valuable medicinal properties, none of the compounds are currently approved by the United States Food and Drug Administration (FDA) and still fall under the category of "dietary supplements", as opposed to approved FDA drugs that are prescribed or over-the-counter medication since they have not undergone enough ample testing. This category is also the one that herbals are marketed and must carry the "not approved for use by FDA label". These include such herbals and Echinacea, St. John's Wort, Ginkgo, Fish Oil, Glucosamine, Cordyceps, etc. Note that in the example below that I am describing the folk medicine description and that most species will not have any demonstrated medicinal efficacy. The description of the species below and their usage is mostly summarized from Hobbs (1995). Auricularia auricula and A. polytricha: The former species is commonly referred to as Jew's Ear. The common name , according to folklore suggests Judas Iscariot, after his betrayal of Jesus Christ, committed suicide by hanging himself on an elder tree. The ear-like shape of the mushroom is said to be the returned spirit of Judas and serves as a reminder of his betrayal. The species has a temperate distribution as opposed to A. polytricha that has a sub-tropical to tropical distribution. The latter species has a variety of common names, but all have the word "ear" in its name because of the ear-shaped basidiocarp. In Hawai‘i, it is referred to as the "pepeiao", the Hawaiian name for ear. Both species belong to the group of Basidiomycota referred to as "jelly fungi" so named because of the consistency of their fruiting body. Both species have been used in folk medicine in for thousands of years in China and has traditionally been used to treat hemorrhoids and as a stomach tonic. In Europe, A. auricula is boiled in a liquid for inflammation of the throat and for eye irritation. Studies have been carried out that gives evidence that A. auricula may be used to enhance one's immune system. Other studies have demonstrated potential other uses, including the lowering of bad cholesterol, as an anticoagulant and possibly anti-diabetic. Boletus edulis: This species is commonly referred to as the King Bolete and as the Cepe in Italy. It is a mycorrhizal fungus that is associated with conifers as well as hardwood trees. There are many species of Boletus, but this is probably the most prized species for eating and is also the only species in the genus that has been found to have antitumor properties. In traditional folk medicine, it is also used in treating lumbago, leg pains, numbness in limbs and tendon discomfort to name a few. Cordyceps sinensis: This species is commonly called the Caterpillar Fungus and has probably been the most extensively studied species. It is a parasitic species that has caterpillar as its host. While it is mostly used medicinally, C. sinensis is also included in some food recipes. It has properties similar to ginseng and is said to be more potent. The first documented of its usage was in 620 AD, during the Tang Dynasty. it has been uses include strengthening of the body after exhaustion or long term illness, impotence, backaches and an antidote for opium poisoning. A lot of claims made of this fungus. Most of them have yet to be sufficiently investigated. In traditional Chinese medicine, Cordyceps has been used to treat respiratory and pulmonary diseases, e.g. renal, liver and cardiovascular diseases. It is also used in treating immune disorder and has been used in association with cancer chemotherapy treatments and surgery. It is also believed to be a remedy for weakness and fatigue and often used as a "rejuvenator" for increase in energy. Successful treatment for impotence, acting as an aphrodisiac has also been demonstrated in clinical human testing. More can be said, but if even half of the listed treatments are, above, are true, it would indeed be a miracle mushroom. Fomitopsis officinalis: A bracket fungus, known under a number of common names, including white agaric, agarick, puring agaric and larch agaric. Aside from its medicinal properties, it has also been used as tinder and also has the common names tinder and touchwood for that reason. This species is probably the oldest traditional medicinal mushroom and was used by both the Greeks and Romans. It was utilized by them as an antidote for poisoning. In later herbals, it was said to be used as a laxative, in preventing flatulence and to rid the intestine of worms and parasites. It was also said to be a successful treatment for malaria, in India. Just prior to the mid 20th. Century, it was still used as a tonic for bronchial asthma and night sweats from tuberculosis. 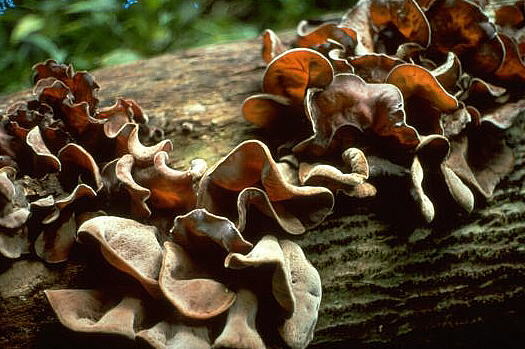 Coriolus versicolor: This is another species of bracket fungus and is commonly referred to as Turkey Tail. It is a common species found world-wide, mostly in temperate regions of the world. The fruiting body has had a number of medicinally useful compounds isolated from it, including the immunoactive PSK and most recently an antitumor polysaccharide that was named coriolan. The PSK has been administered intravenously and orally in human clinical studies of cancer patients and appears to be effective for many forms of cancer, when combined with radiation treatment by enhancing sensitivity of cancer cells to radiation. Survival with treatment of PSK increase survival rate within 5 years was 21% and 52% without. In traditional Chinese medicine, it is used to reduce phlegm, heal pulmonary disorder, increase energy and benefit people with chronic diseases. In Mexican folk medicine, it has been used to treat ringworm. Lentinula edodes: The shiitake is a mushroom that has been utilized for thousands of years, in Japan and China, for its food value and also prized for its medicinal properties as well. It is also the world's second most cultivated mushroom. In folk medicine, it is said to The shiitake is a well studied medicinal mushroom that has undergone many clinical studies. It has the polysaccharide, lentinan, as well as other polysaccharide that have antitumor properties. Other studies have demonstrated that the shiitake also wards off bacteria that have become resistant to bacteria. For example, patients that had contracted antibiotic resistant strains of Mycobacterium tuberculosis, the causal agent of tuberculosis, had improved their conditions when lentinan was given, and helped limit relapses of tuberculosis in the lungs. Treatment for cancerous liver tumors in rats, liver protection and helped produced antibodies to hepatitis B, lower blood levels of cholesterol and lipids and blood pressure. Tremella fuciformis: This is another species of jelly fungi that is commonly called the snow fungus. This species is found growing on hardwood trees, but is not a wood decomposer as was once thought. Instead, it is a species that is parasitic on hosts that belong the order Xylariales of the phylum Ascomycota. Before the realization of its true nature, cultivation of this species was not possible. It is another of the many Chinese traditional medicinal mushrooms that is said to be able to treat many ailments. These include use as an immune tonic, stops asthma and coughing, reduces phlegem, supports the liver and exhaustion, enhance beauty, reduce fevers, heal ulcers, constipation, abnormal menstrual cycles and many others. This species is found in tropical and temperate areas, throughout the world, on hardwood trees. Ganoderma lucidum: Commonly called the Ling-Zhi in China and Reishi in Japan. This species is one of the bracket fungi, but unlike most species, typically has a long slender stalk that attaches to the side of the "cap" of the fruiting body. This species can be found in North and South America, Europe, Asia on hardwood, especially species of oaks. This species has been utilized in Chinese and Japanese folk medicine for approximately 4000 years, for liver problems, chronic hepatitis, hypertension, arthritis, insomnia, bronchitis, gastric ulcer and asthma. A number of anti-cancer constituents have been isolated from G. lucidum. These compounds have demonstrated antitumor and immunostimulating activities. Laboratory studies have also shown that this species have anti-allergic activity, bronchitis preventive effect, acts as an anti-inflammatory, antibacterial activities against certain bacteria, lowers blood pressure and has antioxidant activity. Numerous clinical studies have also been carried out and has been shown to be beneficial in treating a variety of disorders. The above species are merely the most common species that have been studied for their medicinal qualities. There are many more that may be as well studied, but the samples above give you an idea as to what is being done to expand our knowledge of another avenue of medicine. However, let me reiterate that these studies, while impressive, in some cases, still not recognized as treatments for the diseases/ailments that they have been tested for and are not endorsed by the FDA. Furthermore, for some dietary supplement, research should be done before taking the supplement, as some have been demonstrated to be toxic, if taken in greater than the recommended dosage. Calvacin: Strong tumor-retarding compound isolated from Calvatia gigantea, but also occurring in other Calvatia species. While able to retard 14 different lines of mouse, rat and hamster tumors, it proved to be too toxic when animal tests were conducted. Clinical Testing: In reference to invivo testing, where the entire animal is utilized in experimentation. Used for our purpose, experimentation of potential anticancer drugs. Herbal medicine: The use of plants, in a wide variety of forms, for their therapeutic value. Herb plants produce and contain a variety of chemical compounds that act upon the body and are used to prevent or treat disease or promote health and well-being. Immunomodulation: Said of compounds that modify, suppress or enhance immune systems as a means of treating various forms of cancer. Thus, cancer cells are indirectly attacted by the compound. Invivo tests: Experimentation using a whole, or in our example, isolating living cells that have been cultured. Medicinal mushroom: Usually folklore medicinal practice of mushroom to treat diseases and/or promote well being. Few species with taken through scientific method to demonstrate ability to treat diseases/promote well being. What explanation can you give as to why there are more usage of medicinal mushroom in China and Japan than in Western Cultures? How do dietary supplements differ from FDA approved medications? What are researchers generally looking for when attempting to extract novel compounds from mushrooms? There have been numerous species of mushrooms that produce metabolites that have antitumor activities and/or other metabolites of interest. Yet, there are not any approved usage of these compounds. What reasons can you give as to why this is the case? Adams C. Uncloaking the Mysteries of Medicinal Mushrooms. Nutraceuticals World: http://www.nutraceuticalsworld.com/issues/2008/10/view_features/uncloaking-the-mysteries-of-medicinal-mushrooms/, accessed November 28, 2011. Hobbs, C.H. 1995. Medicinal Mushrooms: An Exploration of Tradition, Healing and Culture. Botanica Press, Summertown, Tennessee. Hypericum Depression Trial Study Group. 2002. Effect of Hypericum perforatum (St John's Wort) in Major Depressive Disorder: A Randomized Controlled Trial. JAMA 287: 1807-1814. Lu, X., J. Guo, and T. Hsieh 2003. PC-SPES Inhibits Cell Proliferation by Modulating p21, Cyclins D, E and Band Multiple Cell Cycle-Related Genes in Prostate Cancer Cells. Cell Cycle 2: 59-63. Roland, J.F., Z. F. Chmielewicz, B. A. Weiner, A. M. Gross, O. P. Boening, J. V. Luck, T. J. Bardos, H. Christine Reilly, K. Sugiura, C. Chester Stock, E. H. Lucas, R. U. Byerrum, and J. A. Stevens. 1960. Calvacin: A New Anti-Tumor Agent. Science 132: 1897. Snitz, B.E., E.S. O’Meara, M.C. Carlson, A.M. Arnold, D.G. Ives, S.R. Rapp, J. Saxton, O.L. Lopez, L.O. Dunn, K.M. Sink and S.T. DeKosky, for the Ginkgo Evaluation of Memory (GEM) Study Investigators. 2009. Ginkgo biloba for Preventing Cognitive Decline in Older Adults: A Randomized Trial. JAMA 302:2663-2670. Solomon, P.R., F. Adams, A. Silver, J. Zimmer and DeVeaux, R. 2002. Ginkgo for Memory Enhancement: A Randomized Controlled Trial. JAMA 288: 835-840. Sternberg, S.S., F.S. Philips, A.P. Cronin, J.E. Sodergren, and P.M. Vidal. 1963. Toxicological Studies of Calvacin. Cancer Research 23: 1036-1044. Wasson, R.G. 1968. Soma: Divine Mushroom of Immortality. New York: Harcourt Brace Jovanovich. Wasson, V.P. and R.G. Wasson. 1957. Mushrooms, Russia and History. Pantheon Books, New York. Zaidman, B., M. Yassin, J. Mahajna, and S.P.Wasser. 2005. Medicinal mushroom modulators of molecular targets as cancer therapeutics. Appl. Microbiol. Biotechnol. 67: 453-468.